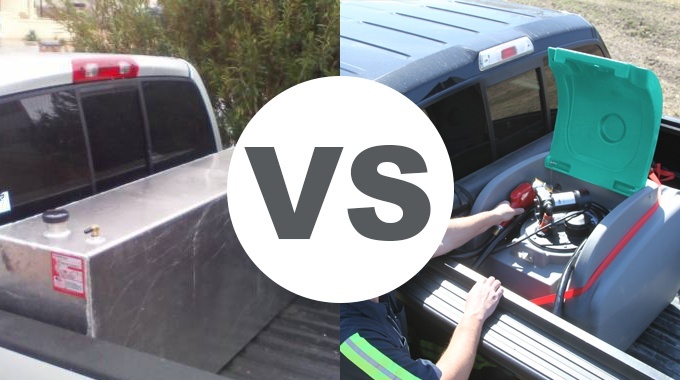 Purchasing a diesel transfer tank for your pickup truck can be a hard decision. This is because there are many shapes and sizes to choose from. If you have a budget, there are also many price ranges to choose from. One choice that is not always considered is what material of tank is best to keep your diesel fuel from contamination. In this article, I researched the key differences between steel and poly diesel transfer tanks. I discovered some interesting information. Material - Poly and steel are very different materials, obviously. When it comes to diesel transfer tanks, there are a few things to be concerned about. When a steel tank is left outside on a hot day, condensation will build up on the inside of your tank causing the moisture to leak into your diesel. Everybody knows that water in your diesel fuel can be extremely harmful to your engine. Poly tanks eliminate this condensation. Poly is lighter although it has a much greater wall thickness. Steel will rust over time. Components - Poly diesel tanks come complete with a pump, hose and gun assembled ready to use. Steel diesel tanks are purchased as a single item. You then have to shop for a pump, hose, gun and components. Assembly can be confusing and time consuming. Portability - Steel diesel transfer tanks are fixed in your truck bed, mostly with bolts through the mounting surface. Poly diesel units can also be mounted this way. However, they can also be easily strapped down if you don't want to fix them permanently. While steel tanks are harder to maneuver, poly tanks come with lifting handles that make them easy to move with two people. Manufacturing - The way steel and poly diesel transfer tanks are built is very different. Steel tanks are wielded which allows for the possibility of leaks on the seams. Poly is a single molded piece with no seams. Warranty - While the average warranty on a steel tank is 1 - 3 years, some poly diesel tanks have a 10-year warranty. This is often a reflection of how long the manufacturer thinks it will last. Price - The price of these 2 options are a lot different to each other. As discussed earlier, when you purchasing a steel diesel transfer tank, you also have to purchase a gun, fittings, pump and hose. This means that on top of the product you purchase, you also have to account for the time it takes to assemble. Poly transfer tanks come complete with all these components assembled and ready to use. The average price of a 100 gallon steel tank with components is ends up being higher than a poly tank. I hope these differences help you make the right decision when you purchase a diesel transfer tank. Although both options have their pros and cons, it's important you consider the investment you are making.